Melbourne is a cosmopolitan, suburban, football crazy city with incredible history, culture and beautiful landscape. The city passionate about food and drinks, entices tourists with the effortless charisma of its people, arts, theatre, exhibitions and musical extravaganzas. Welcome to Melbourne! After immigration and customs, meet our representative outside in the waiting area. Board the coach for your transfer to the hotel. Check in to the hotel. You have the rest of the day free to explore your surroundings and visit nearby shopping areas. You may opt to visit Eureka Skydeck 88 (optional) and experience the awe inspiring view of Melbourne from the Southern Hemisphere’s highest viewing platform You can also enjoy ‘The Edge’ which will make you experience Melbourne in a unique way; sitting in a glass cube which projects 3 metres out from the building and is suspended almost 300 metres above the ground. Overnight stay at the hotel in Melbourne. After a sumptuous breakfast at hotel, proceed for Melbourne City tour. Begin your journey from the Federation Square and explore the cosmopolitan city with wide boulevards and fine historic buildings. Drive past the ultimate shopping strip and business centre of Bourke Street Mall and the tree-lined beauty of Collins Street. View fine examples of Melbourne’s architectural splendour, including St. Paul’s Cathedral, Princess and Regent Theatres. See Melbourne Town Hall, the Royal Exhibition Buildings and Federation Square. Stroll around Melbourne’s spectacular Royal Botanic Gardens. Visit the beautiful Fitzroy Gardens and explore Captain Cook’s Cottage. Pay tribute to the soldiers of war at the historic Shrine of Remembrance. Cross the Bolte Bridge for amazing views of the city skyline. The tour concludes at the Federation Square. Later, you may opt to go for a Philip Island Tour (optional). Journey the coastal highway around the Bay with French Island and Churchill Island in the distance. Once you cross the bridge at San Remo you will enter Phillip Island – natural habitat for Koalas, Fur Seals, Short-tailed shearwater, Little Penguins and many others. Take your place in special viewing stands and get ready for a memorable night as you watch the daily evening ritual of the wild little Penguins. At sunset watch the adorable animals emerge from the sea and waddle to their sand dune destinations. If you want to learn more about the smallest species of penguins in the world head to the Phillip Island Visitors Information Centre. Also visit the Koala Conservation Centre. Overnight stay at the hotel in Melbourne. After a sumptuous breakfast at hotel, enjoy your day at leisure. Today you may opt to go for a full day Great Ocean Road tour (optional). Drive past the world famous Bells Beach; known for hosting World Surfing Championships. See the popular coastal townships of Torquay and Lorne; a surfer’s heaven and retreat. See fern-filled gullies and river inlets on your journey. Tour the length of the Great Ocean Road passing through the towering limestone cliffs, sweeping white beaches and stunning forest scenery. Explore the Twelve Apostles Information Centre. Here the Twelve Apostles are limestone stacks rising dramatically from the Southern Ocean. An amazing photo opportunity! Walk along the boardwalk and enjoy the breath taking scenery around. Listen to the romantic yet tragic story of Loch Ard and marvel at the natural beauty sculpted by years of erosion. Visit Port Campbell, a charming fishing village and summer holiday resort. Listen to the tragic history of over 50 ships wrecked along this rugged coastline. Drive beyond Port Campbell towards the remnants of London Bridge, Razorback and Island Arch. Truly one of the world’s best scenic coastal drives. See the spectacular night lights of Melbourne as you drive past the West Gate Bridge. Overnight stay at the hotel in Melbourne. After a sumptuous breakfast at hotel, proceed for the tour to Sea World. Get below the surface to discover a world of fun and adventure at Sea World. Flip in and out with the dolphins; seal this new friendship with a kiss or dare to dive with the predators of the undersea! Dive into the Sea World, as you are transported to the wonderful underwater world of Bikini Bottom that comes to life right before your eyes with extravagant floats, stunning water displays and spectacular thematic boats in the world's first SpongeBob parade! Later, sing and dance to an educational stage show, as you help Dora the Explorer and friends find each other in a delightful live show ‘Dora's Best Friends Adventure’. Scale new heights at Castaway Bay - the World's best adventure playground. Enter the amazing frozen world of Penguin Encounter, home to the King Penguin. Be enchanted by the charm and beauty of the iconic Sea World dolphins in their new show ‘Imagine’ while the clever and hilarious Sea Lions will have you in stitches in their new show ‘Fish Detectives’. With a host of exciting rides, shows and attractions, Sea World offers a complete day of fun. Overnight stay at the hotel in Gold Coast. Today, you may proceed for a full day tour to Movie World (optional). Experience the magic and excitement of a world where everyone's a star at Warner Bros- Movie World! Experience the fun and thrill of a galactic proportion as you take on the steepest drop in the world. The amazing new Green Lantern Rollercoaster ride is in a league of its own! While you’re here, get lost in a world of fantasy and fun, meet your favourite stars and super-heroes and experience the exhilaration of world-class adventure rides and movie attractions including the awesome Batwing Spaceshot and the adrenalin pumping Superman Escape. Kids will love the colourful Kids’ WB! Fun Zone takes you into a magical cartoon world for the young and for the young at heart! Other not-to-miss attractions include, the multi-million dollar live action stunt show ‘Hollywood Stunt Driver’, presented by Castrol Edge and the spectacular Star Parade. Overnight stay at the hotel in Gold Coast. After a sumptuous breakfast at hotel, check out of the hotel and board your coach for your transfer to the Gold Coast airport. Board your flight for Sydney. On arrival in Sydney, board your coach for your transfer to your hotel. Check in to the hotel. A unique concoction of natural and manmade beauty, Sydney is known as the Harbour City and is both, the oldest as well as the most cosmopolitan city in Australia. 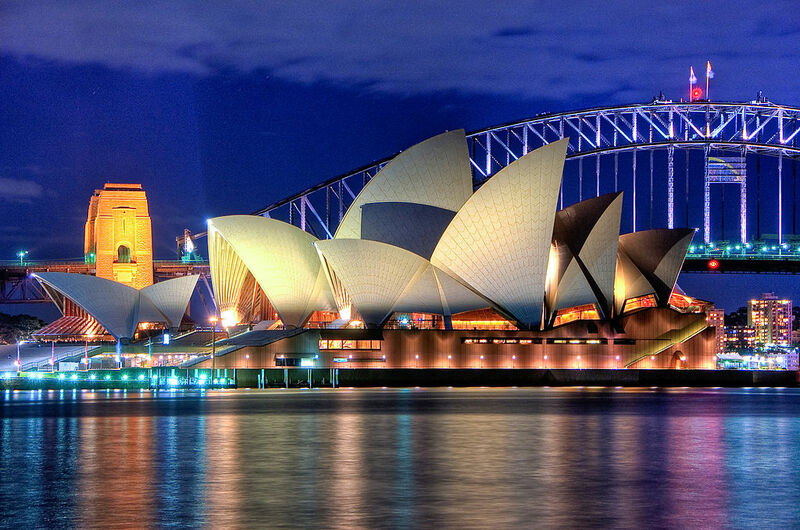 A multifaceted hub, Sydney is laced with history, culture, art, fashion and a variety of cuisines. It offers the traveller intellectual stimulation through interactions as well as the platform to explore some of world's best natural resources. You have the rest of the afternoon free to explore your surroundings and visit nearby shopping areas. In the evening, you may opt to go for a Showboat Dinner Cruise (optional). This luxury restaurant cruise starts from King Street Wharf. Be dazzled by the international show featuring professional Australian show girls in their glamorous costumes! Relish the finest and freshest three-course dinner menu. Be captivated by the breath-taking scenery as you sail through the shimmering Sydney Harbour with its mesmerizing panorama of bright city lights, the Opera House and the famous Harbour Bridge. Overnight stay at the hotel in Sydney. After a sumptuous breakfast at hotel, enjoy your day at leisure. You may proceed for a full day Blue Mountains tour (optional). In New South Wales, bordering the city of Sydney are the majestic Blue Mountains. As tall as 3986 feet above the sea level, these mountains are dissected by gorges and have some amazing waterfalls and quaint, breath-taking views to see and savour. Your day long tour will acquaint you with these views, the flora and fauna and the beautiful environs of Blue Mountains. Overnight stay at the hotel in Sydney. Embark on an underwater journey through Australia's unique freshwater and marine aquatic environments. It is one of the tallest structures in the southern hemisphere and by far the tallest building in Sydney. At a height of whopping 309 metres above Sydney city; the views from the tower are breathtaking-from sights as close as the Harbour Bridge and Opera House to as far away as the beaches and mountains. Get up close to Aussie’s animals in the heart of the city. Features incredible wax statues of stars, world leaders & sports heroes displayed in themed settings. Pose with your favourite star and get yourself clicked. After a sumptuous breakfast at hotel, check out of the hotel and board your coach for your transfer to the airport. Bid goodbye to Australia with memories unlimited.